About 30 years ago, while I was researching an article for Marlin magazine, “Plastics Plague Ocean Life,” an angler fishing a Texas tournament landed a marlin with a plastic ring from a baby bottle around its bill. In the same tournament a fisherman hooked a red snapper sporting a plastic six-pack holder. As I discovered, these events were merely emblematic of an ocean being inundated with our synthetic waste. The danger plastics pose to marine life is much more insidious. Since that summer of 1988, it’s only gotten worse. A report issued in 2016 by the World Economic Forum on “Rethinking the Future of Plastics” i estimates there are 150 million metric tons of plastic floating around in the ocean, with 8 million tons “leaking” into the sea each year, the majority of it discarded containers and packaging. It’s a big ocean, but with those odds, the chances of lethal and sub-lethal encounters are pretty high. In fact, many thousands of turtles, birds, marine mammals and large fish die through entanglement with or ingestion of indigestible plastics. Millions more suffer in one way or another. 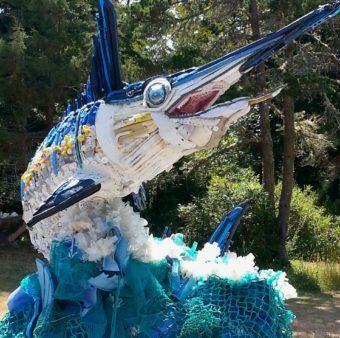 Lost fishing gear and traps made of synthetic materials “ghost fish” indefinitely. Marine animals consuming plastic flotsam, often mistaking it for food, choke to death, starve when it clogs their digestive tracts, or die from lacerations to the stomach wall. In the North Pacific Central Gyre, a vast area where natural re-circulating currents concentrate life, making it a prime feeding ground for many migratory species, the concentration of plastic pollutants is particularly high. Testing randomly selected sites, researchers found over 300,000 pieces of plastic per square mile, with a mass six times the biomass of surface zooplankton. Zooplankton, filter-feeders at the base of the marine food web, are known to consume the tiny plastic particles that resemble fish eggs. Which means the plastics and the chemical additives they contain get passed up the food chain, accumulating in larger animals. Similar studies show high concentrations of plastics in the Sargasso Sea, in the Atlantic’s Central Gyre. The Sargasso is prime habitat for ocean-going fish, turtles and other wildlife. The five Great Lakes, the largest freshwater system on earth, are reportedly burdened with 22 million pounds of plastic debris annually.ii It’s a problem everywhere. Plastic materials, whether in their original form or broken down into non-degradable micro-pellets, can accumulate in the ocean for centuries, underscoring the urgent need to halt the flow of plastics into the sea, which is primarily (80%) from land-based sources, by reducing supply and demand. So far, “anti-litter” laws, in place at the local, national and international levels, on land and at sea, have not been enough to stem the tide. The previously cited report from the World Economic Forum, while it doesn’t pretend to have all the answers, it does provide a global perspective on the problem and proposes “a vision and a roadmap as well as a vehicle” for solving it. The centerpiece is designing a “circular economy” for the plastics industry. That means creating a more cost-effective infrastructure for recovering, recycling and re-using after-use plastic products. Key to closing the circle is providing a sufficient economic incentive to re-capture plastic packaging, cutting down on leakage into natural systems, in particular the ocean. Realizing that demand for packaging and disposable products will continue as will leakage into the environment, industry, governments, researchers and NGOs must work together to explore and adopt renewably-sourced (i.e., biodegradable) and competitively-priced products. Meanwhile, the burden is on the rest of us, the consumers, to become part of the solution. Not just when we’re on or near the water, as anglers, pleasure boaters and beachgoers, but throughout our daily lives. That means reducing our demand for and use of disposable plastics and other synthetics and recycling whatever we do use. The future of the ocean and fishing is linked to the future of plastics. Think about it. The New Plastics Economy: Rethinking the Future of Plastics. World Economic Forum. January 2016. Our Plastic Oceans. Yves Engler. Counterpunch.org. February 3, 2017.